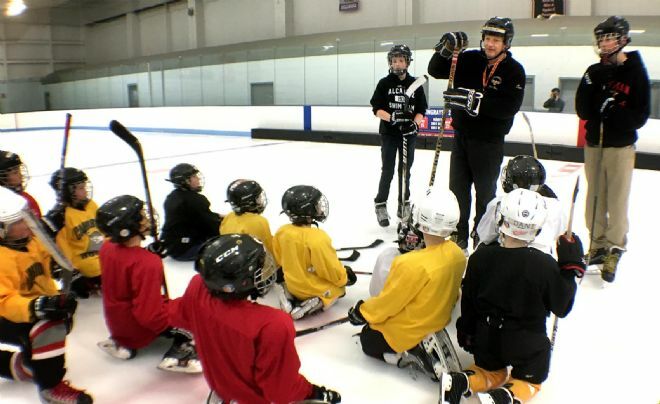 Instructional Hockey introduces boys and girls 4 to 11 years old to ice hockey. The program emphasizes skill development, teamwork, and fun through organized practices and supervised, non-contact games. Tom Sieniewicz directs our Instructional Hockey program, assisted by other CYH volunteers. Each morning begins with warm-ups and hockey instruction tailored for young skaters. The favorite part for all of the kids are the fun scrimmage games that conclude each practice. At the end of the second session all the participants are recognized for their learning and achievement, usually with a small medal and big smiles. Register for the season today: 18 Saturdays at 8:00-10:00 am, December 1st through April 6 - Note: No skate on Dec. 29. Check here, and @CambYouthHockey for schedule changes. Note: The final, scrimmage part of the practice usually ends at approx. 9:50 AM. Parent/Guardians must provide full hockey equipment for Instructional Hockey participants: helmet, shoulder pads, elbow pads, pants, shin guards, socks, gloves, skates, and a stick. Velcro shorts are useful for pelvic protection and as an easy way to hold up the socks. A jersey will be provided by the program but a spare is useful for the first day. Much of this equipment is available for loan from Cambridge Youth Hockey. Financial Aid Form. Families in need are encouraged to apply.